Chris: Amateur Traveler Episode 475. Today, the Amateur Traveler talks about rice terraces and caverns, hanging coffins and an island named The Best Island in the World as we return, like MacArthur, to the Philippines. Chris: Welcome to the Amateur Traveler. I’m your host, Chris Christensen. And now, with no further ado, let’s talk about the Philippines. I’d like to welcome to the show, Julie Longland, who’s coming to us from richandjuliegetamoveon.blogspot.com. And Julie has come to talk to us about the Philippines. Julie, welcome to the show. Chris: Now, I say we’re talking about the Philippines. We did a show recently on a southern portion of the Philippines on Cebu, Bohol, and some of the areas down there, but you’re taking us to some place different. Where are you taking us, first of all? Julie: Right. So there’s a couple of different places that I went to in the Philippines that I want to talk about. One is the northern part of Luzon, which is the big main island that Manila is on. I was in the Cordillera Mountain region which is in the central part of that big island. And then also, another island off the coast just north of Borneo called Palawan, which is also part of the Philippines but quite a remote part of the Philippines. Chris: You mentioned, as you were pitching me this show, that there’s a specific reason why you were pitching Palawan right now, that it just recently received some recognition as a place to go. Julie: Yeah. I was very surprised about this, because I’m actually Filipino-American. And so I’ve been hearing about Palawan for a long time, but someone recently told me that apparently, Condé Nast readers recently voted it the Best Island in the World. So it was really quite a surprise to hear something that had been gaining in popularity among Filipinos to hear that it had really reached the world stage as far as popularity. Chris: And I think that answers one of the questions in terms why would we go to the places you’re going to talk about, but let’s talk about why we would go to the Island of Luzon to the particular mountain range you’re talking about. Julie: Sure. So the Cordillera Mountain region is traditionally a place that I think a lot of Filipinos would visit, but not necessarily many foreigners visit. And one of the amazing sites there is a UNESCO World Heritage site of these ancient rice terraces. While that’s very well-known because of the UNESCO designation, it’s not the easiest place to get to. So I think for many travelers to the Philippines, it’s one of the things that maybe drops off quickly on their itinerary because of the challenges of getting there. Chris: Let’s start with an itinerary. What itinerary would you recommend for us? Julie: So I know that a lot of the times, that you talk about having a week itinerary. It’s a really big stretch to try to get to both places in a week, so I probably recommend one or the other; either the Central Cordillera region for, let’s say, people who are really into the outdoors and really want to have something that is not your average destination for pretty off the beaten path, and I would recommend Palawan for people who are just interested in an exotic paradise to visit. Chris: Where should we start with? Julie: We could start with the Cordillera Mountain region. Chris: Okay, we’re going to fly into Manila, I’m going to assume. And then how are we going to get up there? Julie: Okay. So this is the partly challenging thing. There’s no way to fly up there as far as I know. Basically, the only options are by road, so that’s either hiring a private car or driver to take you or to drive yourself. But these are pretty windy mountain road, so it could be somewhat of a challenge. Or there’s the overnight public bus, which is why I say it’s not necessarily for people who really need all of the luxuries of life. Now, the bus itself is quite comfortable as far as it’s your average coach bus and they do make stops along the way, but these are really the only ways to get up there. Some people do take a stopover and stop in the town of Baguio, which is, let’s say, a traditional place for people in the lower lands to go to cool off in the cooler mountain area. So it’s a good midway point from Manila, but we went directly on the overnight bus. And this way, you weren’t spending an entire day on the bus. Chris: And when we talk about the bus, in developing nations, we get buses everywhere from buses that are fancier than some trains and airplanes that I would take here in the United States to the chicken bus. Where is this on that spectrum? Julie: I was expecting a chicken bus, and this is definitely not a chicken bus. So it was your average American coach bus tour like, let’s say, you’re going on a conference and they have padded seats. I don’t think this one had a toilet on it, but it had air conditioning. They said that they had Wi-Fi which that signal was a little bit intermittent. So it was a pretty comfortable. Chris: That’s actually very similar to the buses I take in the States that tell me they have Wi-Fi. Julie: So that part was actually quite comfortable. And then we did make, I think, two or three stops in the night. If you need a bathroom break or if you want to pick up snacks or a drink or something, there was definitely time for that. Chris: Okay. And when we get there, what are we going to do first? Julie: So the main hub in the Central Cordillera is Banaue; that’s B-A-N-A-U-E. That’s the place that most people think of when you’re saying that you’re going to the Cordillera. And Banaue is a largish town. We didn’t actually stay in Banaue but we did walk around the town a little bit. There’s plenty of restaurants and hotels and little shops to buy things in. So that’s definitely a good jumping off point for someone who wants to stay put in that area. So where we went after spending a little bit of time in Banaue was actually another part of the Cordillera called Batad. And from this, it was probably about an hour ride on the road from Banaue to Batad. It was an hour ride, but the final part of the way to get to Batad is actually you have to hike in because the road just ends. It’s actually a construction site there. Julie: So one thing I did want to say is that I was actually very impressed with the quality of the roads in the Mountain Region, because I knew that in the past, that they could be all kinds of potholes or unpaved. But at least the sections that we were on, they were all actually relatively newly paved and pretty good sections of road. So you would only have to have concerns about if you get car sick because of the twisting part of the mountains, not necessarily because the road itself is rough. But the reason to go to Batad is that there are ancient rice terraces. And actually, there are ancient rice terraces all over the Cordillera, but the ones in Batad are considered to be the most impressive. Chris: Okay. And in terms of the rice terraces, this is obviously something we’re going to go and take pictures of, but is there other ways of experiencing the rice terraces? Are there hikes around them? What else are we doing? Julie: Yes. 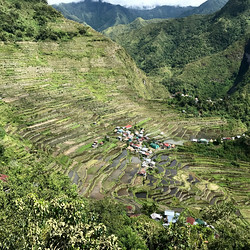 So if you didn’t really feel up to actually hiking, there are some other rice terraces which are not quite so strenuous that you could actually do a day trip from Banaue quite close that you could see. But we wanted to really get into the rice terraces themselves, so that’s why we opted for hiking through them. And there are a variety of hikes that you could do through them. You could just hike for an afternoon or there are places that will organize an overnight hike where you’re staying somewhere and then continuing to hike through the mountains and through the rice terraces. Chris: Okay. And did you do a guided hike or it’s easy to do on your own? Julie: We did a guided hike, and I think that was probably the best choice for us. It is possible to do some hikes, some smaller hikes or shorter hikes by yourself. But one thing that, I guess, didn’t really occur to me until I was there is that when you’re hiking through these rice terraces, you’re essentially hiking through farmer’s fields. Julie: So one thing that was nice about having the guide is that the guide had actually gotten permission from these farmers to go wandering through their fields. And also, there could be times where the routes were blocked off. And if you didn’t have a guide, it could be difficult finding an alternate way. In Batad, its very open, so it’s not like you would get lost, but you might be doing a lot of zigzagging and back and forth trying to find which is the right way back to that village that I can see on the other side of the mountain. So we actually did see some other tourists who were hiking on their own who that ended up being a problem. And we could see them still wandering trying to find, because it’s pretty much like a maze that you could see the destination, but maybe not exactly the best path. Chris: And did you find a local guide or did you arrange that ahead of time? Julie: We actually arranged that ahead of time. Although if you don’t, even when you’re getting off of the bus from Manila into Banaue, there are people who will offer to guide you. Once you get into Batad, you can make arrangements there as well for a guide. Chris: And where did you go to find it ahead of time? Julie: We actually went with a company called Uncharted Philippines, and I definitely recommend their guide. It was a little bit, probably not as cheap as finding just a local guide. Julie: But our guide was very experienced. He knew a lot about the local history. He also happened to be or had worked as a biologist before so he could tell us a lot about the biodiversity. And also, he was really into adventure activities which we are also, and so he was able to give us that perspective on being in the outdoors in the Philippines. Chris: Let’s take a break here and hear from our sponsor. And our sponsor is me, and it’s the course that I did recently called Blogging for Beginners with WordPress. This is a video course that walks you through step-by-step creating your own blog, your first blog assuming you’ve never done this before, or taking you over to WordPress just in case you’ve done it somewhere else. WordPress being the most common and the most blogging software, the one that I use. This is the same course material I used when the Society of American Travel Writers flew me to Iceland to teach the course. And you can get it for less than the cost of a ticket to Iceland. Normally, a $39.00 courses. But for listeners of this show, available for $19.00 if you got to amateurtraveler.com/begin. Isn’t it time to claim your piece of the internet? Your point about it being a little more expensive to do it ahead of time is true for a lot of destinations, especially of things like African Safari’s, how cheap you can get something on the ground. But sometimes it really is nice to know that you have something lined up ahead of time. So it’s not that it’s a bad idea to do it ahead of time, it’s just a choice. Julie: Sure. And he did actually meet us in Manila when we were getting on the overnight bus. But I will say if you’ve ever been say backpacking anywhere in Southeast Asia or in Latin America, to find out where the bus station was and to buy a ticket would be relatively straightforward for anyone who feels comfortable negotiating their own public transport. Chris: Well, and English being fairly widespread in the Philippines would help with that as well. Julie: Yes. And it’s actually interesting that you mentioned that because my family was quite worried about the fact that we were traveling in the Philippines. Julie: Yes, my Filipino family. Which is quite interesting because we have backpacked around Southeast Asia, so we had the argument that at least here, we could understand the language even if they choose not to speak in English. But the interesting thing is in the Philippines, even though everyone speaks English, there are many, many local languages. So even though I understand Filipino Tagalog, which is the most common language, it was interesting to hear the other languages in the different parts of the Philippines. Chris: Now, your family was concerned for safety reasons, I’m assuming. How did you feel after having been there? Did you come back and just say, “I told you so,” or were there some legitimate reasons for concern? Chris: I believe they may not be the only ones. Julie: They may not be the only one. But as far as safety, for the most part in the entire in the Philippines, just your basic things any time that you’re traveling in a third world country or in a big city, make sure you watch your stuff and you don’t leave your bag laying around without anybody to attend it. Julie: There are some security concerns, generally more in the southern part of the Philippines. This is in the Mindanao Island. That’s very, very south. And most of those concerns, those are the main safety concerns that I think should be aware of. Also, the fact, it is a third world country, so people drive like they want to drive. And there may not be seat belts and buses maybe crowded with people hanging on outside. Julie: But nothing abnormally dangerous for anyone who’s traveled in those kinds of situations before. Chris: Well, that’s funny. Because so often, many families are concerned about terrorism and you getting murdered in your sleep or something like that. And really, traffic is the one risk that’s more realistic. Julie: Right. I would say that that’s probably the number one safety issue in the Philippines. It’s just traffic. Chris: And then where did you go from there? Or did you do anything else while you were up in the rice fields? Julie: One thing that I did want to mention is that we have been to rice fields in Thailand and in Vietnam, Northern Sapa, which a lot of people are really amazed to go visit at. But these rice terraces were far and above more impressive than those that I’d seen before. They were built over 2000 years ago and they were hand-hewn out of the mountain rock. And a lot of the foundations and the structural parts are still stone or some of them might be reinforced with some kind of concrete. So it is quite impressive. And the nice thing about Batad and why the Batad rice terraces are so special is that it’s set in this open amphitheater vista so that the village is a very small little section, maybe a third of the way up the mountain, and then you have this grand landscape all the way around you. So it was really quite impressive. And for hiking, we did do some hiking there. It’s really good exercise. This was something that we weren’t really expecting. We had heard you’re going to be hiking for a few hours at a time. Make sure you bring whatever you need for that. I had considered bringing hiking boots and trekking poles. I don’t think those would have gone amiss. I will say that. So some of our companions, they had been to Machu Picchu and hiked the Inca trail, and they said that the amount of steps were akin to what they had hiked there. So it’s good because the rice terraces are mostly paved or stone carved, but there are a lot of steps. So if you have any knee issues or just have trouble negotiating endless steps, that’s definitely going to be a good workout for you, and maybe something that I wouldn’t recommend for people who might have mobility issues. Julie: An interesting thing that happened to us when we got there, which I’m sure is not necessarily something that all tourist necessarily see, is we actually came in on a celebration. The people that we were staying in their home stay, they were actually slaughtering two water buffalo in celebration. Julie: So we found out that it was this big celebration because the patriarch of the family had gone to the hospital and had basically been given a prognosis of maybe a year to live. And he survived and he returned from the hospital, so it was this huge thanksgiving celebration. I think it’s a nice window to Filipino culture in that we really like to celebrate, and celebrating is a big deal. And so you can imagine that for some farmers, killing two water buffalo in celebration, which water buffalo can be your tractor. They can be your source of milk. They could be your source of meat. Killing two of them is quite a grand gesture, an extravagant gesture to show your Thanksgiving and your celebration. Batad is a tiny, tiny village where probably every family is related to each other, but they had probably a hundred people visiting from relatives and people from other towns that had come. And all of them got to take a piece of the water buffalo, or carabao, as we call them in the Philippines’ home as part of the celebration. So we got to see them slaughtered, which was not necessarily humane for most people, but it was a very interesting ritual. And even though a lot of the indigenous Ifugao people who live in that area have converted to Christianity, or specifically, Roman Catholicism. It’s interesting because you can still see some of the remnants of their animistic traditions. For example, the blood was carted away to be used in some special rituals and ceremonies that they have. We saw some traditional dancing that they do there. Along the rice terraces, you’ll see these little carvings that are known as Rice Gods, and those are to promote a good harvest and prosperity in the family. So it was interesting to see this really ancient culture and their traditions still hanging on. Chris: And you mentioned at the beginning of that, the family you were staying with. How did you arrange your home stay? And I got the impression, there wasn’t a Hyatt or a Hilton around. Chris: It wasn’t like you had that option. Julie: Sure. So that is the thing that if you’re visiting Batad, you pretty much are looking at backpacker level accommodations. So this one actually has a website. The home stay actually, the guide had booked for us previously, but you can book directly from their website. There were several other houses or home stays that you could stay in also in Batad. Like I said, they are backpacker accommodations so there wasn’t any air conditioning, but I was actually quite pleasantly surprised to see that there was hot water. So the toilets were your bucket flush toilets that are pretty typical anywhere in third world countries where you’re in a more rural setting. Chris: Sure. Where to next? Julie: After we did some hiking there, one of the other things that you can hike too there is also a waterfall, and it’s called Tappiyah Waterfall. And that’s quite a good maybe two-hour hike to that waterfall, and you can go swimming in the waterfall as well. Then after Batad, we returned to Banaue just because that’s the best transportation hub, and then we took a private can or a van to Sagada, which is another town in the Cordillera Mountain Region. And the nice thing about Sagada is it’s this quiet mountain retreat town. So if anyone, like you said, most people coming into the Philippines will have to fly into Manila. And Manila is a crazy, chaotic big city traffic place. And so to come to somewhere like Sagada, which is this beautiful, relaxed, peaceful mountain setting is a really nice break for people who may not have wanted to spend their time in the big city. One thing that was interesting is there is actually a sign we saw where there was a noise curfew. So after, I think it was like 10:00 or 9:00, they had quiet hours throughout the town which kind of contributes to its peaceful setting. So the reason that most people go to Sagada is to look at the hanging coffins. Julie: So this is a tradition again from the indigenous mountain people, a different kind of indigenous mountain people than the people in Batad. I believe they were the Igorot tribes. In Sagada and the surrounding regions, they believe that when people die, they put them in coffins, but those coffins should still have access to sunlight. In that way, the spirits of their ancestors can still roam freely. And so they have a lot of affinity for the mountains and the rocks, and so there are these different areas where you can walk to. One place is called Echo Valley. That was relatively close to the town where you can go and see these coffins. So some of them are very simple coffins that are half placed in these shallow caves. They’re quite shallow, because as I mentioned, it was important that the sunlight is able to touch the coffins. Some of those coffins are quite simple wooden coffins, so they have rotted away and you can see some skeletons. And then other coffins of the tribal elders, they have the chance to be buried as a hanging coffin. And these are actually on the side of the cliff face. And you can actually hike to see them. Now, as I understand it, originally, there were some vine plants that they could actually secure the coffins in. But as those either plants have died or maybe no longer grow there, they secure them a little bit more modernly with different pegs in them. So you’ll actually see a cliff face where they look like coffins just attached to the side and they have different markings. Some of them have different markings on them, but the oldest ones which could be, I think they said 200, 300, 400 years old would be very simple basically like wooden caskets. Chris: And it looks like there are other objects attached to some of them from the pictures that I’m looking at, like chairs and easels and such. Are those something significant to the person whose coffin it is, I assume? Julie: Well actually, the chair thing is not necessarily significant to that person. What we understand is that traditionally, the Igorot people, when they die or are dying, they don’t die in a death bed; they die in a chair. Julie: So I believe the ones that have chairs, that’s why they decided to also hang those because those was where the people died. Julie: Yeah. So the other amazing thing about Sagada are the caves. And there are caves throughout the Philippines, but the ones in Sagada were quite impressive. There are two cave sections. One is called Lumiang and the other is called Sumaguing. And the things about these is that they’re both separate caves sections. But actually, they’ve found a narrow passageway where you could actually start in one and finish in the other. And if you were going to do the entire cave connection area, that would be about four hours in the cave, which for me is quite a lot of time to be in a cave. So typically, you would have to hire a guide. You can hire a guide right at the entrance to the cave. So we actually started in Sumaguing Cave. We hired a local guide. He’s a guy in flip-flops and a kerosene lantern. And really, that’s pretty much all you need. It probably could be helpful if you had a large group to maybe have your own head lamps, but the kerosene lantern did have quite a bit of light. Again, since the Philippines is a developing country, if you were expecting say helmets or safety harnesses, this is not something that you would see in the caves in Sagada. This did add a really exciting element of adventure to the cave area and it was really pretty fun as an adventure sport. It was actually, there were sections that were almost more like rock climbing. So again, you probably want to be a little bit fitter if you’re going to do the entire four hour section. Chris: Well, and what I would was reading about was prepare to get wet, and you have to swim at least 10 meters across one portion. Julie: So I think that depends on the time of year that your visiting. Julie: So we were there in late May, and there was one section where you could wade across and it was probably hip height or hip deep, so you don’t really need to swim then. Chris: But you are going to get wet? Julie: But you are going to get wet. Julie: That was really the only one real section where you were wet. You will get dirty though because there are a lot of times where you might actually be better off just sliding on your bottom down some of the sections. And there are, they do say and we did find, there are some very tight passes. Julie: There’s actually one crevice that I almost got stuck in. But as the guide said, “Don’t worry, the rocks are flexible.” It was actually. And you do have to be quite comfortable negotiating your way around. There were a few times where you actually use the guide as your ladder. Julie: And there are a couple where he tells you, “Step on my knee,” or, “Step on my shoulder.” And there were a couple of times where there are ropes that are anchored into the wall that you’ll need to use to secure yourself as your going down or climbing up. Julie: But I will say that it was a really… I mean, we’ve been to some caves and other places in Belize. I will say that they were really quite impressive caves. Not all of the sections were so narrow. There were other times where it opened up to be the size of the cathedral inside, and it was really impressive to just be. When we were in the larger cave, we were the only people in the larger cave. Whereas towards the end, which was the Lumiang Cave, that’s the easy section. So that’s where you’re going to see a lot more of the tourists, and so it’s quite crowded there. Now, that’s where some of the more impressive rock formations are with stalactites and stalagmites, but it was quite busy and quite loud. Chris: Okay. Now, I feel like we’re going to be accused here of being a little bit of a tease because we’ve talked about the Best Island in the World, and we haven’t gotten there yet. Is there anything else we want to do up here in Luzon? Julie: There was a small museum in Bantigue, which is another town that details some of the indigenous tribal culture, and there are some mock ups of how a traditional village would look. Probably half hour or an hour, there is a nice way to spend a little bit of time. But other than that, I didn’t really get to see other parts, and those were really the best parts. Chris: Excellent. So then, we’ve got Part 2 here. although we also saw some international flights. So I think there might have been, for example, flights from Taiwan into Palawan. Julie: So it’s quite remote, so either you have to get a flight there. Or I believe, there is an option to take a ferry from the southern part of Luzon. But I imagine that that ferry would probably be at least an overnight to get to Palawan. Chris: Okay. Yeah, it looks like it’s a little bit of a distance like a hundred miles or something. Julie: Most people will end up in Puerto Princesa, which is the capital of Palawan. And also, that’s where the main airport is. It’s a relatively compact town. The rest of Palawan is not so developed. So if you want the town feel and being able to walk around and go shopping and the choice of restaurants and the choice of hotels, Puerto Princesa is the jumping off point. Julie: There are a lot of day trips that are available from there. We really only went on one but there are a number of day trips. A popular thing to go to is Honda Bay which has a lot of little tiny islands where you can do one of these island hopping tours where you’re snorkeling and swimming on different little beaches of islands that I’m not even sure are big enough to have their own names. But that’s a very popular thing. I know that there are also kayaking trips that you can do around those different little island parts too that we looked into, but we unfortunately didn’t get a chance to go to. The main tourist attraction outside of Puerto Princesa is a couple of hours away in Sabang. And here, you have the Puerto Princesa subterranean river. And this is also a national park. And it’s supposed to be, I believe, the longest subterranean river in the world. So you can actually go to Sabang, and this a good two hour drive from Puerto Princesa. You go to Sabang and you hop on these traditional boats called ‘bangka’ which are these narrow thin boats with like a catamaran where they have stabilizers on either side. And you take these bangka out to the national park because you do need a permit and they do need your passport to actually enter the national park part. So once you get there, there are few little nature trails that you can go to, which are interesting because something that’s indigenous to this national park are monitor lizards. Julie: So you can see these giant lizards just on the side of the path scurrying away. There are also monkeys that are also living in the national park. And the guides are quite adamant about making sure that you not have any plastic bags, that you hold onto all of your belongings, because I understand that these monkeys are not afraid of people and are very frequently thieves for any unwatched belongings. So when you get to the park besides the little nature trails, there’s also the actual subterranean river. So there are boats almost more like canoes that you pile into. There’s probably eight people, I think, to a canoe, and someone gets to volunteer to hold the spotlight. And then your guide in the canoe will basically ferry you through the subterranean river. So this is basically a cave structure again, and it’s quite extensive. We only go in about 45 minutes to an hour. I believe you could get special permits to go in, I think, three or four hours deep into the cave. But most people just do the 45 minutes to an hour. And so in there, you’ll see some really amazing stalactites and stalagmites and rock formations. Again, some of them quite open. You should probably not be afraid of bats or swallows and not mind the smell of Guano. Chris: And you talked about this being large. I was looking this up and it’s 50 miles long. Chris: It turns out that they have discovered a longer one just recently in Mexico, and I suspect because we’re talking about underground rivers that we may discover yet another one longer than that one; still a little hard to tell. Julie: Yeah, it’s quite possible. And I think with how the river is situated, it wouldn’t surprise me if there were parts that possibly with the tides get inaccessible at certain times of the year, so that size could possibly fluctuate. Chris: Okay. I was just curious because I grew up in a town with an underground river and they used to tell us it was the longest one in the world. And apparently, that is not true. Chris: Or not true anymore, at least. Julie: Yeah. The other thing is that going to and from the national park on those bangkas, that area of sea waters, actually, it’s quite common to see turtles. So while you’re taking your boat ride out there, we did a lot of turtle spotting along the way, which is quite exciting when they come up right up next to you. Outside of Puerto Princesa, we went to the northern end of Palawan. And that area is mostly known as El Nido. It’s the most popular area. That’s where you really, really want to go if you want to do some of the really amazing snorkeling, and let’s say rock activities. So a lot of water sports and a lot of rock climbing or caving is another option; kayaking, sailing, things like that. Now there is the town of El Nido and the town of Taytay. And you can actually stay in those towns. But the people that I was traveling with, we were really interested in staying out on the smaller islands. And since that’s also a restricted area due to conservation interests, to stay out on the actual smaller islands off of Palawan, you pretty much have to go with staying in the main resort chain. And that’s called El Nido Resorts. So there are several of those islands that are pretty much wholly owned and operated by the resort, and we stayed in one called Apulit. And the nice thing about this is that so when you think of like Tahiti or Bora Bora, you think of these beautiful thatched roof private huts that are over the water, and that’s what you can stay in El Nido. And that was something that we’ve never done and we’ve always wanted to do. Chris: I’m going to guess it’s a little cheaper here than in French Polynesia? Julie: I don’t know exactly what the prices are in French Polynesia. It is definitely on the expensive end for the Philippines. Julie: I’m guessing it’s still probably cheaper than in French Polynesia. Chris: Roughly how much are we talking about? Julie: So I think the cheapest resort was probably close to $400 a night. Julie: And the most expensive had your own private pool for each hut, and I didn’t even ask how much those were. Yeah, so you can stay out on a hut and we stayed in one of these wonderful water cottages where you can take your stairs down and there’s a coral reef right there where you can go snorkeling right next to your room, which I think is an experience that most people would love to have once in their lifetime. Chris: Absolutely, as long as somebody else is paying for it. Julie: Yeah. And the nice thing too is that the resorts. Because they are concerned about conservation, there are a lot of efforts that they do to actually conserve water, support sustainable fishing, etc. So you can definitely feel like your footprint is minimized while you’re there. On these outer islands in Palawan, if you enjoy snorkeling or diving, this is really a great place to go. And I will say I’ve been snorkeling in other places. I’ve been in Belize. I’ve been in Thailand. I’ve been on the Great Barrier Reef and the Galapagos, and I would say maybe just under the Great Barrier Reef and the Galapagos, this was some of the best snorkeling that I have ever seen. And the really nice part is that there are so many little coral reefs that you’re never really crowded. And for people who aren’t strong swimmers, the waters are relatively calm. And so you can go out, swim a little out, snorkel, go back to the beach if you get tired. Or there’s not a really strong current, so you don’t necessarily have to worry about bashing into the rocks or anything. The diversity of corals was really impressive. That was something that I wasn’t expecting. And the quality of the fish and the diversity of the fish was also impressive. There were very small stretches of coral reef where you could see most of the tropical fish that I think you’d see in an aquarium including clown fish and parrot fish and angel fish, even a barracuda. I was really amazed by that. And I did hear one statistic in one of the guide books. I can’t remember which, but I believe it was something like 70% or some really high percentage of the tropical fish that you see sold for aquariums actually comes from the Philippines. And our guide who was the biologist was telling us that the biodiversity within the coral reefs in the Philippines was really quite unique among other places. Chris: We need to start wrapping this up. Chris: Do we have any other highlights that we want to cover first? Julie: Since Palawan is limestone, they do have these limestone Karst formations similar to what you would see in like Hạ Long Bay in Vietnam. There are really great opportunities for things like rock climbing or repelling, and there’s also seems lots more opportunities for caving. So that is something that really adds to the beauty and the adventure of Palawan. Chris: Excellent. With all the places that you went on this trip, if I said you were standing in the prettiest spot you saw, where would you be standing and what would you be looking at? Julie: We’ve got these gorgeous waters. You have this amazing coral. You have these amazing fish. Really, snorkeling in the Philippines is quite amazing, and it’s a very nice setting for some really gorgeous sunsets. Chris: And do you have any money saving tips for us other than don’t stay in places that are $400 a night? Julie: Food is actually, can be very reasonable. You can bargain in a lot of the shops. There are also shops that you can go to where if you don’t feel comfortable bargaining, there are set prices. So definitely, buying souvenirs can be very reasonable. Buying jewelry, pearls, there’s a lot of shopping that can be very reasonable. And food is very plentiful and diverse and delicious and cheap. Chris: Now, you were coming back to the Philippines. Had you ever been there before or lived there? Julie: I hadn’t lived there, but I have visited several times in my life. Julie: And I still have family there. Chris: Okay. Anything surprise you about the Philippines this time? Julie: One thing. I was traveling with some people who had never been, and I had given them some warnings about some things. And I was very pleasantly surprised to find that they were not true or they didn’t seem to be true anymore. There was a time where corruption was pretty rampant. That’s not to say that it doesn’t still exist, but there used to be a time say even 10 years ago or 15, 20 years ago where to get some things done, you had to have either a fixer or you had to slip some money to people. Chris: Even just as a traveler? Not just starting a business or something like that? Julie: Right. So for example, to make sure that you got your bags without anybody riffling through them, that kind of thing. I didn’t see hardly any of that while I was there. Now, one of my relatives in the Philippines said that he felt like because the economy was good and the recent politicians had been good about cracking down on that, that didn’t seem to be an issue as much as it used to be in the past. Chris: Interesting. When where you in the Philippines and it felt like home to you? Julie: This is the weirdest thing for me. I live in North Carolina, which is also known as the Land of the Pines. In the Cordillera, especially in the areas around Sagada, there are Pine Trees there, which I hadn’t really ever pictured in the Philippines, so much so that there are actually some examples of architecture that are clearly trying to look like log cabins. Julie: There was actually even a restaurant in Sagada called the Log Cabin Restaurant that was in a log cabin. And that was something that was both surprising and very much felt like North Carolina. Chris: Well then just briefly on food, you mentioned restaurants. Is there some dish that we should make sure we try when we’re in the Philippines? Julie: There are many dishes in the Philippines to try. So one thing I wouldn’t recommend is I tried, in Palawan, a native dish which was described to me as a mollusk. Julie: But it is a wood worm. I believe people who may have watched Bizarre Foods with Andrew Zimmern may have seen him eat such a thing. But things I would recommend, Filipino food is the original fusion cuisine, so there are things like Spanish food, things like Chinese food, things like other Southeast Asian cuisine. One thing that I think everyone should try as much as possible and as often as possible, like even possibly every day, is halo-halo. So this is a snack or a desert and its shaved ice. Julie: And a variety of candied fruits, sweet beans, and other legumes that you mix together with the shaved ice. And if you want the special version, you should get the special version which could have a little bit of ice cream, which is Taro ice cream, or also a scoop of plan, like the egg custard. You get a little shot of the evaporated milk. You pour that on. It comes in a tall sundae or parfait glass. You mix up the whole thing. Halo-halo means mix, mix. So you mix up the whole thing and it’s a delightful refreshing treat. And you get to try, a lot of the candied fruits are also really typical candied fruits that you would only get in the Philippines. So for example, there could be candied jackfruit is very common in there. There could be candied young coconut. This one jello made out of a flavor from this leaf of a plant called the Pandan, which is normally green. Julie: So it’s a nice mix of many kinds of very typical Filipino things all in one glass, and it’s delicious. And for most people, the Philippines is really hot so it’s very refreshing. Chris: Right. Hot and humid, I’m assuming, most of the places. Julie: Yes, and you can get it on the street. You can get it in restaurants. You can get it many places, and everyone has their own take on it. Chris: Excellent. Before I get to my last three questions, anything else we should know before we go to the Philippines? Julie: Yeah. I think it’s underrated. Julie: That most Americans don’t really think about it unless maybe they’ve been in the military, and that it’s a destination that a lot of people should consider even when they’re thinking about Thailand or Vietnam or other places in Southeast Asia. It takes a little more work to get there, but I think it’s definitely worth it. Chris: Well, that’s one of the reasons why even though we’ve done a show on the Philippines recently, I thought it was worth doing another one. One thing that makes you laugh and say, “Only in the Philippines.”? And so this sentiment about ‘have a little shame for yourself’, I think, is so typical to always consider other people and to consider how you might be representing Filipinos to other people. So it’s really funny that it has a very normal connotation for “Please flush for the next person,” in English. But there’s this little reminder in Tagalog for Filipinos that you are representing the Philippines and you need to show your best face. Chris: Interesting. Finish this sentence for me. You really know you’re in the Philippines when what? Julie: You really know you’re in the Philippines when you see a water buffalo being slaughtered with a machete. Chris: I noticed you did not list water buffalo as one of those meals that we have to try. Julie: I didn’t actually get to try any of the water buffalo, because I think they were being given away as presents. There is an excellent dish, which is typically made with oxtail that I would also recommend for people to try. It’s called kare-kare. And it’s this oxtail stew sometimes with tripe that is cooked in this peanut sauce, which is absolutely delicious. And a typical side condiment with it is bagoóng, which is fermented shrimp paste, which is also very Filipino. Filipinos like to eat the bagoóng even with unripe mangos. That’s something that I would definitely recommend. Chris: And if we had to summarize the portions of the Philippines that you were at this time in three words, what three words would you use? Chris: And there was really no way to get a longer URL than that? Julie: No. We started it five or six years ago and we just couldn’t think of a shorter one than that. Chris: And is there a particular article that you would recommend if people were going to go to your blog? Julie: There are a series of posts in greater detail about the Philippines, so I would recommend reading those. I also have a map on there of all the other places that we’ve been. So if any of those locations sound like they’re some place that you’re interested in, be sure to search the blog for them. Chris: Excellent. Thanks so much for coming on the Amateur Traveler and sharing with us your love for the Philippines. Pat commented on a recent show that we did on Hamburg and said, “Just listened to the Hamburg Podcast just a few days after returning from there. Still love to hear of new places for when I return, I would add Harry’s Hoffenboser found in a refurbished creen ship at the port. Fantastic collection of art and artifacts collected by Harry, a local bar owner who asked sailors to bring him something from their travels. The result is everything from shrunken heads to African and Asian masks.” Pat. thanks so much for your comment. With that, we’ll end this episode of Amateur Traveler. If you have any questions, send an email to host at amateurtraveler.com. Or better yet, leave a comment on this episode at amateurtraveler.com or a review for it on iTunes or your favorite podcast software. You can find me on Twitter, Instagram or Pinterest as Chris2x. The transcript of this episode when it comes out is sponsored by JayWay Travel, experts in Eastern European Travel. And as always, thanks so much for listening.